We first hear a voice, then a name. Then we see a face associated with the name. The "character" always comes second-hand. Few get to converse and obtain a first-hand account. I first heard the voice in a duet with Gunadasa Kapuge about twenty years ago. The song, "Ruwak Adenava", was a conversation between two friends, one intent on dousing the flames of lost love in drink (nura viraha gini niva damannai sura vethin ma dethola themanne) and the other advising against it. It was a rich voice that had control and the unmistakable signature of a warm embracing of Sinhala folk song. At least to my untrained ear. We knew Kapuge, at the time the lone unwavering voice against tyranny. We did not know "Divulgane". Outside the area which could tune into the Rajarata Sevaya, few knew him. And then the name arrived. This was around 1990, when he came out with his first casette, Esata Asuvana Mayime (the horizon caught by the eye). Last week I met the man. He was born to a farming family who had for generations lived in a small village several miles off Galgamuwa, Divulgane. The name, naturally, came from the fact that there were fifty acres of land containing woodapple trees. He was the 6th in a family of 10. He had five older brothers and four younger sisters. He was named Karunaratne, Herath Mudiyanselage Karunaratne. Young Karunaratne had attended the village school. "I went to the pol athu iskole" he said. He never had any serious training in music. "I learnt from my brothers. They were far more talented than I. One of them, Ratnayake, was a flautist. For one reason or another, none of them had the drive I had to become a singer. In any case it is not easy to get out of the village and strike out on your own. Very few people manage to do it. When I was a schoolboy I would sing in the samithi-samagam. But talent alone will not get you anywhere, especially when you come from a background such as mine." As a young boy, Karunaratne had been attracted to leftist ideas and he says that politics played an important role in his life, both the personal and the professional. "In particular, I was greatly inspired by Russian literature. It gave me strength of character, the will to live and appreciate life". "There was also Manel Rajakaruna and Nirmala Abeynayake. Jayatilleke Bandara and Senanayake Weralliyadde joined us about six years later. Exceptional lyricists such as Mahinda Dissanayake, Mahinda Chandrasekera, Rev. Pallegama Hemarathana, Ranjith Rupasinghe etc., were also associated with the Rajarata Sevaya. I must mention Swarna Sri Banadara, a producer, who encouraged me and helped me a lot during this time, as I came out with my own songs." It was around this time that he took on the name "Divulgane". "It was Swarna Sri Bandara, a producer, who first made the suggestion. He was born in a village close to mine. We were in fact on opposite sides of the Galgiriya Kande. I also thought this was a good idea, especially since I wanted to acknowledge my heritage." 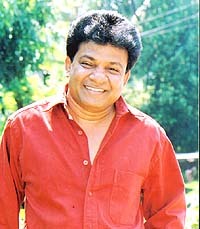 Kapuge had joined the Rajarata Sevaya around 1983 as the music producer. "He was a beacon of light. We got to sing some extremely beautiful melodies. In fact, it was Kapuge that composed the music for my first song, Esata Asuwana Mayime. After some time, they advertised for "Announcers" and I was selected. So I became an announcer. I was popular among our listeners, but I wanted people from all parts of the country to listen to my songs. At that time there was only the SLBC. So I thought I would tape some songs. I recorded a cassette at a studio, getting into debt in the process and sent it to SLBC. Since I was not a registered artiste, it was rejected." Fortunately for him, Wijayananda Jayaweera, Director of Rajarata Sevaya, decided to hand the cassette over to Livy Wijemanne. Wijemanne had liked it immensely and had said, "we can cut some records in Colombo". From then on his songs were played over SLBC. Naturally he was thrilled. Around the end of 1988, Rohana Weerasinghe had called Divulgane and proposed working together on a cassette, which Singlanka would repoduce. Obviously this was great news to Divulgane. "I went out to the tea boutique in Kada Panaha , had a cup of plain tea and a cigarette". It was indeed an extraordinary day for the young artiste. Hardly 15 minutes had passed since he received this piece of good news. Returning after his mild "celebration" he was informed that he, along with Kapuge and Jayatilleke Bandara were fired. "This was during the bheeshanaya. We were branded as leftists. The order had come from Colombo." It was indeed a difficult time for the three friends. They had spent about three weeks, hiding at a friends place in Gampola. Thereafter they had taken refuge in the Hunupitiya Gangarama temple with Rev. Rambukana Siddhartha, a renowned lyricist and a great fan of their talents. "Siddhartha Hamuduruwo treated us well. We helped him with his cassette, "Samanala Kanda". In fact it included one of my songs, "Veherak Vage Ping Dun Kenek" a song celebrating motherhood. Kapuge composed the music. Gradually things became better. We earned some money singing at birthday parties in and around Colombo. Then Siddhartha Hamuduruwo suggested that we put together a concert. Since Kapuge was already known, Jayatilleke and I decided to sing in the chorus. This is how the popular concert "Kampana" was born. The first show was at the Lumbini. It was a roaring success and we were inundated with invitations to perform. Those days we were always on the road. I got paid Rs.1000 for each show and this was a huge sum of money at that time." Meanwhile, his desire to put out a cassette of his own had not diminished one bit. Kapuge had encouraged him. So he left "Kampana". The cassette, Esata Asuwana Mayime, was an instant success and Divulgane quickly became one of the most sought after artiste in the country. "I got to perform all over the island. I got some money and was able to do some of the things I wanted to do. I built a house for my mother, close to our maha gedera which was already over a hundred years old. I moved to Colombo permanently." Esata Asuwana Mayime was followed by "Nethata Ulelak" (A festival for the eyes) around 1994. Both cassettes were produced by Singlanka. The third, "Nil Diyawara" (Blue Waters) was out in 1998 and "Sanhinda Pamula" came out a few days ago. The last two were produced by Nilwala. The word Sanhinda is not easily translated. It refers to a refuge, a shelter, a place where one seeks redress to grievances, where one can find peace, etc. In a way, Divulganes songs themselves amount to a sanhinda of sorts. He doesnt believe that song can bring about social transformation. For him, what music does it to give peace to the listener, enhance his/her sensitivity to the human condition. Perhaps it is best put in Sinhala, "geethaya apiva nivanava". Few artistes walk alone. Singers never do. Divulgane acknowledges that he was fortunate to work with the best lyricists and composers in the country. Rev. Siddhartha, Rev. Pallegama Hemarathana, Ratne Sri Wijesinghe, Yamuna Malini Perera, Ravi Siriwardena, and Samudra Wettasinghe are certainly among our top song-writers. Apart from Kapuge, Divulgane has benefitted from the expertise of top class composers such as Rohana Weerasinge, H.M.Jayawardena. Divulgane is not a prolific producer of cassettes; four in twelve years is hardly a high rate of production. Perhaps this is because he is a perfectionist of sorts. He is very picky when it comes to choosing songs and melodies. And he should be. "These days we see young singers catering to the cheap and extremely transient tastes of the younger generation. Any superior artistic creation must be embraced by the rasikas across time and regardless of age and generation." Divulganes songs certainly possess this quality. He believes that a song should caress and trouble the insides of the listener, should make him sensitive to the human condition. Today there are hundreds of singers and the market is flooded with their cassettes and CDs. There are catchy tunes and interesting lyrics. Few are etched in our hearts. Many of Divulganes songs, on the other hand, have shaped the way we see the world, feel it and respond to it. It believe this is not on account of any particular political thrust, but a probing of the eternal verities one notices in them. "The song should speak to the heart; it should persuade the listener to go beyond the simple surface meaning of the lyrics." It is not difficult to see that Divulgane is seriously engaged in such an effort. One could also say that he has not been unsuccessful.